The word "arbitrage," as I understand it, means taking advantage of the time lag with which information is transmitted between markets in order to buy in one market and sell at a favorable price in another to those who don’t yet know what you know. It has nothing to do with the new movie of that name by Nicholas Jarecki. His hero Robert Miller (Richard Gere) is not engaged in arbitrage but in out-and-out fraud, falsely representing by means of accounting chicanery the company he is trying to sell as solvent when it is not. The fact that — spoiler alert! — he gets away with this and that the person he sells the company to, James Mayfield (Graydon Carter), chooses to do nothing to bring him to justice suggests that Mr Jarecki, who wrote the screenplay as well as directing, (a) has some very peculiar ideas about the way business works and (b) himself can see no important difference between legal and illegal transactions. To him, it appears, they’re equally unpalatable. That rich people routinely swindle each other as well as the general public is simply a given, which I suppose makes it easy for him to believe that everything they do is more or less crooked. Yet he also rather admires Mr Gere’s character for the success with which he pulls off a bigger swindle than his competitors are able to do. And this isn’t even the main plot of the movie! It is, rather, the framework within which a technical sub-plot is able to dominate our attention. For Robert Miller is not only a crook and a fraudster, he is also a love-rat and a hypocrite. In time-honored fashion, he is presented to us as an ideal family man, surrounded by wife (Susan Sarandon) and adoring child (Brit Marling) for about five minutes before we see him driving off with his French mistress (Laetitia Casta) in a Mercedes which he promptly crashes, killing her. As he is in the midst of trying to pull off the previously mentioned fraud at Mr Mayfield’s expense, he calculates that he can’t afford the bad publicity (among other things) that would attend his reporting the accident, so he naturally decides to cover it up. This he is able to accomplish, to the extent he does accomplish it, with the help of the only sympathetic character in the movie, Jimmy Grant (Nate Parker), who is a black youth of some twenty summers whose late father was such a loyal employee that Miller agreed, before he died, to "look after" young Jimmy. Now he has to call in some presumed favors in order to get Jimmy’s assistance in fooling the cops. Unfortunately, one cop in particular, Detective Michael Bryer (Tim Roth), is hot on his trail and threatening to throw the book at Jimmy (who is on probation) if he doesn’t give up his friend. Gosh! What do you think will happen? 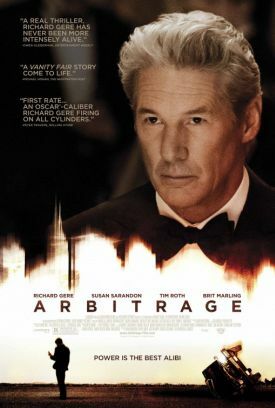 Do I need to tell you that the detective proves to be just as corrupt, albeit with different motives, as everybody else in Arbitrage — apart, of course, from Jimmy, who is the only convicted criminal? But just as Robert in Sydney Carton mode is about to give himself up in order to save his protégé from being sent back to prison — see? he’s not such a bad guy after all — he realizes that the cop’s dishonesty may give him a way to elude the grasp of the law for a second time. How can we not wish for his success in doing so when even the guy he swindles insists on giving him a pass? True, he’s still got to pay the price for his marital infidelity, but we may have good hopes that he will have to pay no other. The best line in the picture comes as Robert Miller is questioned by his lawyer (Stuart Margolin) about Jimmy and why he would "put your family’s future in this kid’s hands." "He’s not like us," Miller explains. "Is that a good thing?" asks the lawyer. Indeed it is! The only thing in this movie that remotely resembles a moral principle is Jimmy’s steadfast adherence to the thieves’ code of honor: that you don’t snitch to the cops on your pals and benefactors. Jimmy learned that on the streets where the likes of Robert Miller consigned him, which gave him at least that much of a moral advantage over his social betters — men (and women too) who, we may safely assume, have no principles at all except where they may be convenient. In fact, Miller’s moral awakening to self-sacrifice in determining to give it all up for Jimmy, even though he is not forced to go through with actually doing so, is seen as the saving grace which allows us to root for his success in defeating justice. In a world where everyone is a crook, the crook with any glimmer of conscience shines with the lustre of a good deed in a naughty world. But is that a world which exists anywhere outside of the movies? I’m guessing not.